Cillian Murphy in The Dark Knight Rises. It’s not your imagination: We’ve been in a superhero-movie boom for nearly two decades now. 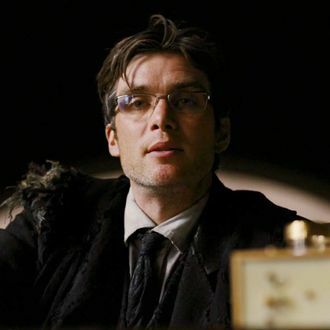 But as Hollywood continues to reboot old franchises and stir up support for even the most obscure comic-book characters, Cillian Murphy, like many of us, has to ask: Are we running out of caped crusader stories to adapt? “Have they exhausted every single comic book ever?” Murphy asked from a giant, comfy chair in his New York hotel room during a recent Vulture interview for his upcoming film Anthropoid. “I don’t know where they’re coming from anymore.” It’s an interesting question coming from Murphy, who played Dr. Jonathan Crane a.k.a. Scarecrow in Christopher Nolan’s Batman Begins, The Dark Knight, and The Dark Knight Rises. Those three films debuted just as easily accessible special effects helped create a boom of movies specifically engineered to metastasize overseas, yielding the glut of half-baked, spandex-laden films that have come since. From over on the couch, Murphy’s Anthropoid co-star Jamie Dornan perked up and chimed in. “I’ll play Pop,” Dornan said.